EMU industrial output fell by 1% in January. IP trends are relatively steady over 12 months and six months, but output is down to a 1.9% rate of growth over three months. Manufacturing output trends are in the 4.5% to 6% range over three months, six months and 12 months without any clear trends but finishing with a weak note over three months. Manufacturing trends find consumer goods output overall decelerating from a 12-month pace of 3.0% to 1.8% over six months to 0.4% over three months. On its own, consumer durables output gains are 4% over 12 months, dropping off to 1.5% over six months and back up to a 5% pace over three months. Nondurable goods output's rate of growth slips from a 3% pace over 12 months to 1.8% over six months to 0% over three months. Intermediate goods output also decelerates steadily from 5.3% over 12 months to a 3.4% pace over three months. But capital goods are contrary. Their output, which is already strongly, expands at an 8% gain over 12 months, steps up to 11.8% over six months and steps up again to a 14.6% annual rate over three months. Looking at trends according to the early-reporters, Germany, Spain, Finland, the Netherlands, Malta, Greece and Sweden all show industrial production growth rates getting progressively stronger over shorter horizons. In the case of Greece, it is a set of declining growth rates that get progressive smaller (less weak). Only France shows the opposite deteriorating growth rate trend. Despite these trends, France, the Netherlands, Malta and Greece show output declines in January. Greece and Malta each have two monthly declines in the last three months despite their accelerating trends in growth rates. On balance, country-level growth rates seem to show a lot of acceleration in IP trends. But broken down by sector, consumer goods and intermediate goods show deceleration with only capital goods accelerating. However, the acceleration from capital goods is impressive; it is on very strong growth rates starting at 8% and move higher. It is hard to be pessimistic about EMU industrial output after looking at the details of this report, even though they are mixed. 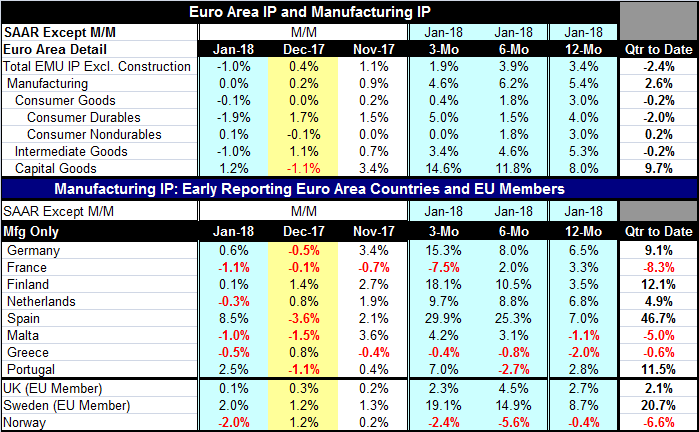 But just as clearly there are some significant cross currents with three of eight early IP reporting countries showing output declines in Q1 as the early data come in. Another issue that separately should not be discarded is that consumer goods output is progressively slowing although on mixed trends and performance for durable goods vs. nondurable goods. I do not believe you can drive persistent strong growth on capital spending without a very solid participation from consumers. China showed an early jump in industrial output and early gains in retail sales, but with the lunar holiday early in the year China's data always take some time to settle down and to determine a trend. Other data from Asia have hinted at growth that is still not accelerating the way growth in the West seems to have done. Japan's core machinery orders did jump in January but that only offset an even larger monthly contraction in December. Asia is not in the vanguard of growth acceleration. Global growth still seems to be well in train. However geopolitical risks pose a minefield of potential troubles stemming from the new aggressive U.S. trade policy to what apparently are pending U.S. talks with North Korea. In the meantime, Britain and Russia have seen their relations take a sudden chill as the U.K. says evidence points clearly to Russia having attacked two people with cold-war era nerve agents on U.K. soil. The U.S. is the middle of a policy re-boot as well with Rex Tillerson out as Secretary of State. PM Abe is fighting off a real estate scandal in Japan. Angela Merkel officially is back in office again in Germany today, but with fewer super-powers than before. Sometimes it gets so complicated it's hard to tell the players without a score card. It seems that it is getting that way again.